Lynettea made me add 'others' in the title. I suppose she thinks we have to be fair. I told her that her Santa hat would not fit me. 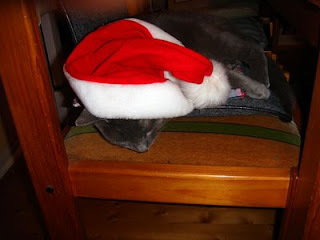 After a few poses in the Santa hat I was completely exhausted and had to lie down. It is too heavy for me and has a large pom pom. Happy Christmas to all the kitties who visit my blog. I haven't managed to contribute to the display by the Australian kitties as I was prevented from answering my email by some human we know. I didn't even know I had some emails, as she hadn't looked at them. I felt that was exaggerating a bit. Maybe I am a little nervous. But it is the pram mainly, or the stroller, or the jumping and running and screeching. Just a minute, I think I will have to take a break. one of my all time favourites. 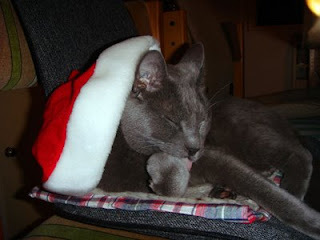 Particularly where Cat Wenceslas goes out into the snow to help the poor cats and give them food. Thank you my friends for your encouraging comments. Lynettea has been selling my book to a few of her friends and sending the profits to the Animal Welfare League to help unfortunate kitties and dogs. She hasn't sold a huge number, but she says that every little helps. I thought we could focus the money mainly on unfortunate kitties, but it turns out that you have to be fair to the other creatures. I hoped that some of the time we could favour the cats. I counted up the pictures on the cards Animal Welfare was selling and there were a lot more dog pictures than cat pictures. MIAOUW MIAOUW MIAOUW! If my little book is helping other animals I can't really complain if a few of her friends find it funny. I think they will find all sorts of useful advice in there that will help them understand the thoughts of their own cats and perhaps become better at looking after the cats. I hope any kitties that read the book will appreciate it for what it is ... a heartfelt and frank look at cat/human relations and an attempt at understanding the mysteries of the human mind from the cat point of view. In my book I have a lovely photo of my pawsie. 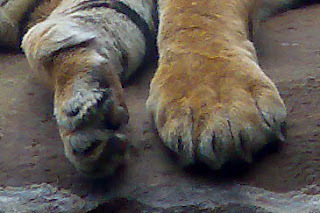 One of Lynettea's 'friends' told her that I shouldn't call it a 'pawsie'. 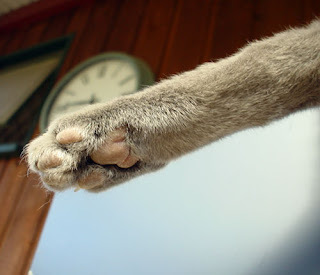 Well Lynettea calls it a 'pawsie', so how am I supposed to know? I asked her and she said 'Well Diamond, I suppose it is really kitten-talk and you should say 'paw'. Now she tells me, after twelve years of referring to them as pawsies! I must be the oldest cat in the world still having kitten-talk used to him. I am twelve, in case you have forgotten. I find this very disturbing and feel that my human is trying to keep me a kitten instead of admitting I am a mature cat. Is there some Office I can ring and COMPLAIN? If I wasn't such a well mannered Gentlecat, I might suggest putting the 'BITEY' on the 'friend'. As it is, I suppose I will have to suffer in silence. With Lynettea's help, using one of her computer programs, I made a little GIFT BOOK of my favourite blog entries. Lynettea showed it to some of her friends and they thought it was very funny. Is this insulting? I try to run a blog with serious commentary. You kitties know that I have raised some important topics on my blog, like dementia in cats, the inventor of the cat flap, FIV, etc. I saw one of these 'friends' laughing at my attempts to make myself attractive to lure a film director. So, am I supposed to lack all ambition? Am I a mere plaything for my bean, I ask. If I dwell on this too much I am sure to sink into a fit of depression. Yes I have been ready to use the computer for a long time. I can see how long it is since my last post. I am trying to hypnotize Lynettea with my flashing eyes so she will let me near the keyboard. She has been busy writing out my Christmas cards with my picture on the front, so I can't be too hard on her. Can you see my portrait? It always stands near the computer so my bean will never forget me. Even if I am asleep somewhere she can see my noble face smiling at her. We have been doing a lot of walking around outside in the sunshine lately. Sometimes Lynettea does some gardening while I sit and supervise her. She even has to cut my grass clump, as it is growing so fast. Then she puts it on the garden for mulch. The Greater Flamingo is doing well now after his shockingly traumatic experience. Lynettea took this photo for me on 17th November. I have only just managed to get it to put on my blog. If I didn't take some initiative I would get no photos at all. He is back in his pond with his faithful companion and you can see them standing together in the picture below. 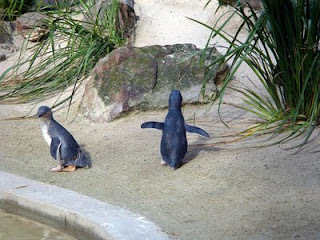 photo from the passing zoo visitors. Some people think he may not be standing quite as close. The Zoo Volunteers have been standing guard near his enclosure watching his every move to check how he is doing and also see that no-one interferes with him. Just an update from my bean Lynettea. She saw the Flamingo yesterday at the Zoo and he was eating a tiny bit (not much, which is a concern), drinking some water and preening his feathers energetically. He stood in the water for a long time with his other flamingo friend, then came and stood quite close to the path on the grass. He is still a very trusting flamingo. Some Zoo Volunteers were watching over him carefully and visitors to the zoo were coming to check on him all the time. One small girl gave a card for the Greater Flamingo to Lynettea so she could give it to the staff at the Zoo. Lynettea is a Zoo Volunteer. The card was very pretty, as the little girl had drawn a nice picture of the flamingo on the front and neatly printed quite a long message to the flamingo inside the card. The Zoo Staff told Lynettea that they are collecting all the cards and plan to do something with them. I will post some new pictures of the flamingo soon. For those, like me, who are worried about the injured elderly Greater Flamingo there is some good news. He went back to his night quarters last night, which is a special shed near the Flamingo Grotto, to be with his friend the Chilean Flamingo. Today, 31st October, he is standing on his own and back in his usual exhibit, the Flamingo Grotto, which has a little waterfall and a pool for the two flamingos to wade in, as well as a nice piece of lawn. The Adelaide Zoo has a notice up about the flamingo's progress, as well as some pictures of the poor bird strung up in a hammock and information about these two flamingos and flamingos in general. The Flamingo Grotto was built in 1885 and is the oldest exhibit in the zoo, as well as housing the oldest creature in the zoo. I did hear that he had been beaten with a mobile phone, which is most distressing. What a senseless act! We cats can but wonder at the cruelty of some humans. I am making a lot of purrs for his recovery. Dear friends, I am horrified. Lynettea told me that one of my friends of another species has been attacked by cowardly louts. 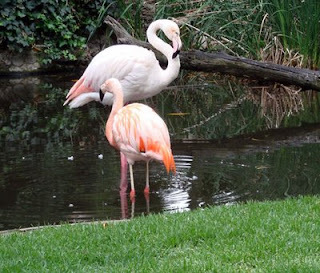 The elderly Greater Flamingo, the one on the left of the photo, suffered injuries to his beak and head. This bird may be the oldest flamingo in the world. He is about 75. Lynettea took their photo only a couple of weeks ago. She is very upset that anyone would attack the gentle bird. 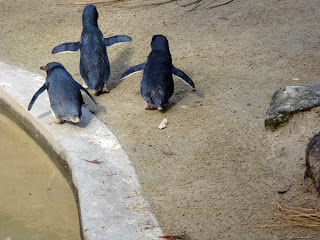 He used to stand near the edge of the enclosure close to people, showing no fear. 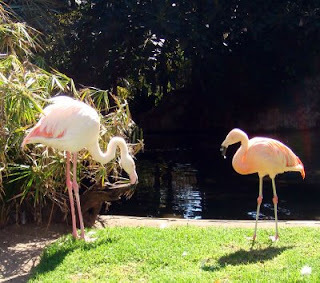 He and his companion, a Chilean Flamingo came to the zoo in the 1930's (ancient times) as eggs. The Greater Flamingo is now blind and the other one almost blind, so they help one another. I feel very sad, but Lynettea told me that the Greater Flamingo may be recovering now. The other flamingo would be sad without him. 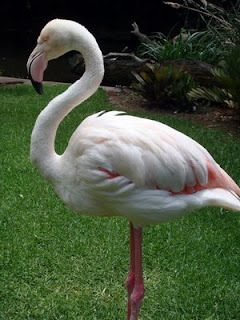 Labels: flamingo attacked, friend of another species, oldest flamingo in the world. Some of my kind friends were worried by my comments about the dog. Thank you my dear friends. Taking the bell off my halter seems to have worked quite well and the dog isn't barking at me anymore. I wonder if it is still there. All seems very quiet at the moment, except for some people banging and hammering or drilling and sawing. Humans can make a lot of noise. It would be quieter if they had paws . Has anyone thought of that? Lynettea decided to lend me a few of her photos, as she thought my blog was getting a bit dull. 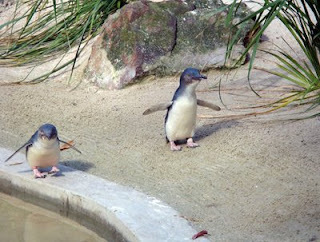 Here are some Fairy Penguins at Adelaide Zoo. 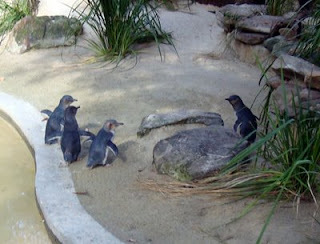 They have just moved to their new enclosure, which is temporary, but they don't know that. They will get a new home when the new Panda exhibit is finished. Meanwhile they are deciding whether they like this new place. So they decide to have a meeting. Here they are at their meeting. My new neighbour is a DOG. I can't see him really well through the crack in the fence. He looks a sort of sandy colour. He barks and growls and I run inside. Lynettea is quite distressed about this and has now taken the bell off my halter. We tiptoed out very quietly this morning and the dog didn't hear us. I was able to poke around in our garden and look through the fence a bit. Then I heard a noise and I decided to go in. Even though it wasn't a bark or growl, I was just so keyed up and alert that I didn't want to go outside after that. I think we will have to start going out in the evening again. Katinka's mummy came out to see me a lot and gave me some unusual foods, which I picked at to be polite. Meanwhile Lynettea was far away in Armidale at her College reunion. She took a lot of photos, but not much really interesting. 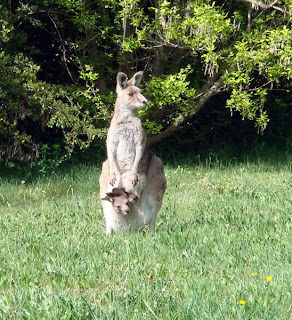 I managed to pick out this shot of a kangaroo and her joey that was hopping around in her friend's backyard. There were quite a few kangaroos hopping around there apparently. They were just wild kangaroos, not pets. The joey is quite large, as you can see, with its head sticking out of the pouch. There was a cat called Tango living there too, so I put in her photo. I could smell this cat on Lynettea when I got back. What a tiring experience. I have told Lynettea that I don't want anymore short holidays for a while. I have been telling her loudly most of the day, so I hope she gets the message. Labels: holidays, kangaroo and joey, tango. Lynettea was packing the suitcase and then she rang Katinka's mummy. They were talking about me, as I heard my name mentioned. I was in another room, but my ears pricked up and I came in just as Katinka's mummy was saying she would pick me up tomorrow. Does that mean that I have to go after all? Lynettea says she doesn't want to leave me here on my own, but I will only be away for a short time. I wonder if Katinka will let me go in her spa if she has one. Normally I don't like water though. I fell in the fishpond when I was young and naive and my fur got very sopped. I hope I get something to eat,or I will be very hungry by the time Lynettea gets back. What a lot of worrrrrrrries. Miaouwwww. Don't worry about me my friends. I am brave and intrepid and will get through this. 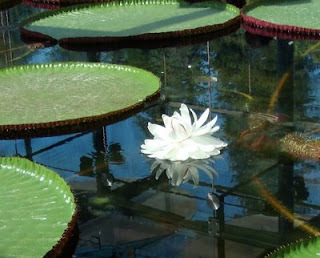 I will try to be calm and meditate on the beautiful Amazon lily Lynettea photographed for me in the Adelaide Botanic Gardens. Maybe if I shut my eyes peacefully then when I wake up I will find this is all just a nasty dream. Does anyone have Katinka's email address? Because I think I want to send her an email explaining that I won't be able to come after all, as I have pressing duties here looking after Lynettea. There is a suitcase in the hallway now. Does that mean Lynettea is thinking of going away? She needs to be here so I can look after her. 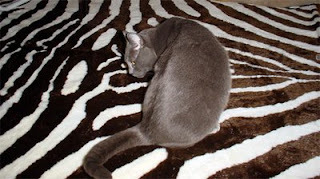 Here I am in my velvet house. I am not using this house at the moment, after I spent a lot of time in it, day and night for around a week. Lynettea thinks it is because one of her friends patted me in the house and I didn't like that. She has washed the fluffy that I have on the floor of the house and she keeps saying, 'Look Diamond, what a lovely fresh fluffy and I have smoothed it all out for you.' Then she puts her arm in and smooths it all out so I can see. I watch, but don't go inside. 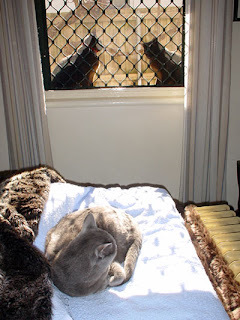 I prefer to sleep under the blanket or under the downdraft from the heater in the loungeroom. And of course during the day I just live on my hot water service. What would I do without that. 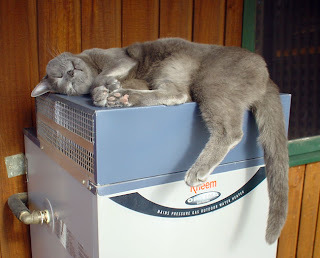 EveryCat should have his own hot water service to sleep on. 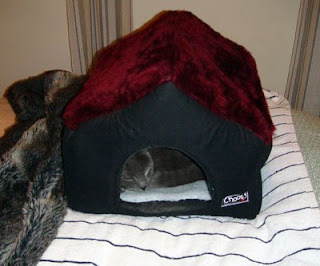 I don't have a picture of it, but I am sleeping in my velvet house. Lynettea decided to get my house out from the top of the cupboard, as the nights are getting chilly. She put it on the end of our bed. I say 'our bed' because I let her use part of it at night. I am enjoying going into the little red velvet house. 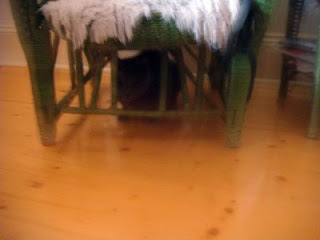 It has a fluffy little woolly rug on the bottom and is nice and comfy when I curl up. Lynettea says she is willing to sleep with her legs hooked up all night if it means that I can stay warm. I don't like to use the velvet house in any of the other rooms. When we watch TV I lie on the lounge. You have seen plenty of pictures of me doing that. And during the day I often sit on my hot water service, so I can keep one eye out for the rough street cats that jump over the fence and sneak about in the yard. (Wallis and Jai and some others). Maybe I will get some other pictures soon to post. If I am lucky! Lynettea took some photos of me in the velvet house. 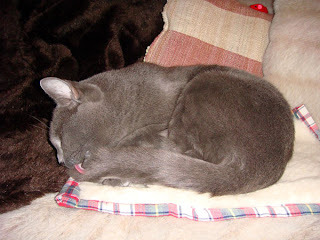 Hello Kitties, at long last I am permitted to add some pictures to my blog. My friends have probably forgotten me by now (hint hint to Lynettea). It is extremely important to maintain agility as we age. 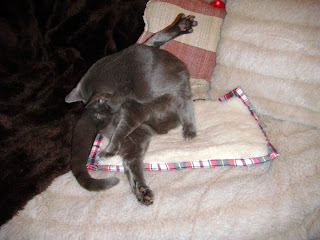 I find it hard to really concentrate on my grooming exercises while Lynettea is 'trying' to do Pilates. I don't think she is very good at it. I usually offer to help her by running under her raised legs in an attempt to support her, but she insists she can do it alone. She seems more interested in whether I am still on my own mat than anything else. She won't get very far that way. I usually concentrate on serious grooming when I lie on my wool rug on the lounge. You can see how agile I am. Attention to detail is also very important for any well groomed cat. You can observe here that I am grooming the fine furs on the tip of my tail. See how shiny my fur looks! Can you see my little mousie at the top of the picture. Mousie gets a bit lonely, so I play with him a bit sometimes. A pity he is such an odd red colour. I think some cruel person must have put dye on his furs. My dear Kitty friends, I have been left alone. You can see how lonely I look in this picture. When Lynettea is out I miss her. She thinks I am asleep all the time, but this is far from true. Sometimes I sleep, but at other times I would like to have a bit of decent conversation with someone. Lynettea leaves the computer switched off most of the time she isn't using it herself, so I can't even visit my friends on their blogs. 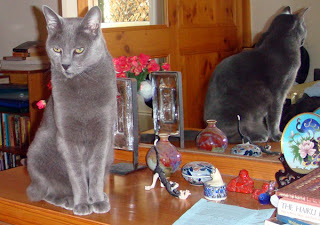 Sometimes I am even driven to try to speak to the CAT IN THE MIRROR! This is a pest cat that lurks around. I sometimes get nervous that it will spring on me when I am asleep, as it lurks in my bedroom quite a lot. It is not a bad looking cat and if it tried to be a bit pleasant and not lurk so much it might even become a friend. There is not much sign of that at present. Lynettea read one of her poems on the radio last night, but she forgot to leave the radio on when she went out, so I didn't get a chance to listen to it. 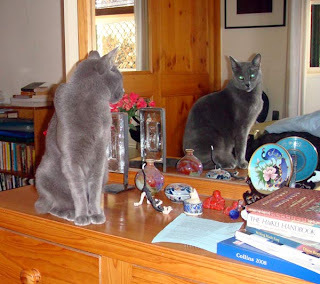 After a fruitless attempt to speak to the CAT IN THE MIRROR I brushed up on my haiku. You can see my books at the side of the picture. At last I can get onto the computer and post a message to my friends. You can blame Lynettea for not letting me send any messages. At least she still feeds me and I go out for a walk sometimes. We went out this morning and I sniffed around my favourite places. Then Lynettea started to sweep up my outside enclosure and you will never guess, that wretched Jai from next door started clawing at the broom fronds from under the gate. Lynettea thought it was very funny and kept putting the broom near the gate so he could poke his devilish black paws underneath and swipe at it. I got down from my hot water service to take a look too. All quiet now, so I think I will take a nap. I missed visiting all my favourite kitty friends and I hope you like my new picture. 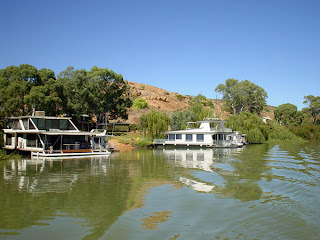 Lynettea may have been too busy to let me post on my blog, but she wasn't too busy to leave me here all day and go on a cruise on the Murray River at Mannum. She showed me her pictures that she took. This one looks nice and cool and there are some houseboats on the bank. I don't know if any cats live in them. Lynettea said she didn't see any, but she is not as observant as I am. She said the river is very low and they had to walk on a special plank down about two metres to get on the boat. Apparently there isn't much water because other people upstream have it and don't want to let it go downstream. How mean are they! Because the swampy edges have dried out there are hardly any birds around the river at that place now. I will have to hope it rains, although I am not personally keen on rain. I guess I can stay indoors if it rains one day or two. Lynettea says 'Don't be silly Diamond, the world doesn't run to your order.' Well I was only trying to be helpful! I like other beings to have a fair go, even if they are birds. I haven't been able to blog because Lynettea has been too busy and shooing me away from the computer. I have only managed to get on now because she has her back turned. I have been concerned about Wallis and Jai, who vanished, but they are back now. They don't seem as aggressive. Maybe they were in a cat reform centre. 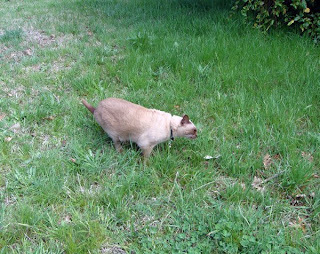 It was nice to be able to walk in my garden without territorial struggles with other cats. In case anyone is concerned I am well. I went to 'my vet' for some jabs. Lynettea accompanied me in the taxi as my bodyguard. 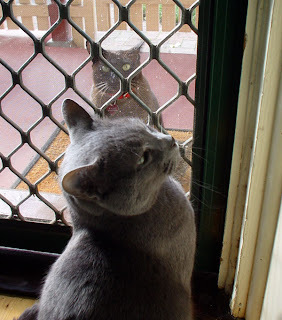 As I am a special cat, I have a bodyguard whenever I am outside. I don't find this vet as annoying as the other one. I think he likes me better than the other one does. I let him jab the needles into me without flinching, although I had to grit my teeth. There were a lot of dogs at the vet and one came up and sniffed at me in my carrier. Some children looked at me and admired my fur, which must have looked very attractive. I always have attractive fur. I take care of my coat and also have a lot of brushing. It must be the award season for me as I have received another award from Camie's Kitties , the 'You make my day award,' which is very generous of them. I pointed out to Lynettea the comment that I don't blog much, but she said, 'I am not getting into that discussion again, Diamond' She thinks I will sit all day on the computer visiting my friends if she let me. 'Why not?' I say. A cat has to have a social life. What makes her think she can be the only one to have friends. Most of the cats around here are too savage and unpleasant to be friends. They either want to attack me or to take over my house. Sometimes it is like living in a place under siege, with me dashing from window to window, always on the alert. Wallis nearly got in a couple of days ago. Lynettea then wanted me to go out on my lead to, 'Have a game with your friend Wallis.' I let her know that I preferred to lie in my outside recliner scratching post with my lead dangling over the edge and watch her defend the gate for once. What do I keep a human for anyway. Lynettea said, 'Be careful Diamond, or you may lose the caring cat award!' You can't lose an award after it has been given to you though. Can you? I am still trying to think of who hasn't received the Thinking Blogger Award, which was awarded to me by Snow and Forest a little while ago. I am giving it to some cats who may have received it before. House of the Mostly Black Cats who have a sick Mommy. That makes you think about how worrying it is to have your bean ill. I hope she gets a lot better soon. We are also awarding The Thinking Blogger Award to Anita in the Canary Islands. 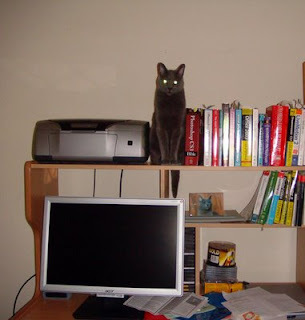 Because we think that a cat who can write a blog in Spanish and English deserves the award. Pretty Kittypuss Cat, Felix, Sascha, Lillipilli and Snuffly Benaut from Adelaide Daily Photo, South Australia. These cats help their humans run a blog which has lots of photos and information about where I live. I am awarding all these cats the Thinking Blogger Award too. I think this must make up my total. 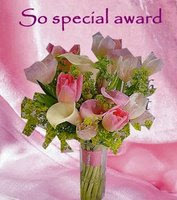 Enjoy the award kitties and try to pass it on to another five cats who run interesting blogs that make you think. It is Australia Day today. 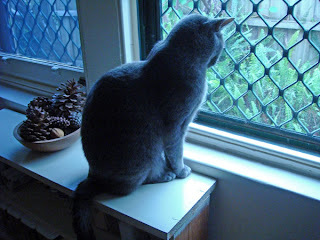 Happy Australia Day to all my readers, cat and human! It is hot here and I haven't attended any celebrations. I am lying on the bed in the air conditioning and controlling Lynettea's fingers through my catelepathy. All you cat bloggers will know about this special skill. Gypsy and Tasha, two kitties from Melbourne, have given me this very special and pretty award. Thank you! I like to look at it. I wonder if the green stuff is suitable for cats to eat. I like to get my teeth into a grass tussock occasionally. There don't seem to be any special rules for this award and I am not sure who has already received it. I will pass it on to Daisy the Curly Cat, as I think we would all agree she is special, with all the modelling work she has. She must also be very tolerant of her human to do all that dress up stuff. 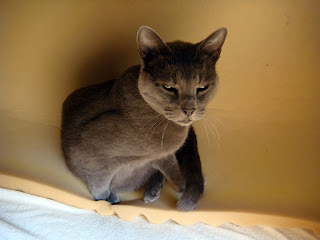 Also we will pass it to Maus and Allegra who must be special, as they are Russian Blues and Sanjee and Gree who are looking after their Mom, as she isn't well. Maybe this will cheer her up. She can look at the pretty flowers. I found these on the Internet and thought some of you other kitties might like to look at this very educational web page. Your beans might like to have a look too and it would be suitably educational for them. I am also awarding the Caring Cat Award to Junior who is a very caring cat and loves his Meowm. 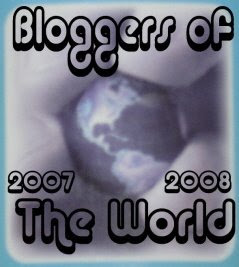 Boy has very kindly awarded me the Bloggers of the World Award. I will pass on this award to Maus and Allegra who are two Russian Blue cats like me and live in Germany and Yoggie who lives in Sweden and Gypsy and Tasha who live in Melbourne, Australia. Two more Australian cats Hooray! Now I will have to visit them all and tell them about their award. I will be busy! A happy day to all kitties. Enjoy yourselves wherever you are. Purrs and hugs from Diamond. Lynettea says I can pass this award on to some other kitties we know are very caring, so I am sending it to Adan and to Boy who are both very loving kitties. I can tell this from the way they write in their blogs. Maybe I will send it to some other cats too later. What fun! Lynettea helped me put a weather gadget on our page. I told her I was tired of telling my cat friends who visit that our weather was different. They are often freezing while I am boiling hot. Our weather gadget, that I found on Yoggie's blog will tell my visitors what it is like here. Which is 24 degrees C at the moment and very nice. 6.38 pm in the evening. I think I need my food tray filled and must supervise the fish feeding now. I sometimes stand on the edge of the pond to see if every fish is getting his or her fair share. It is good to see my cat friends visiting. Thank you for coming. I try to visit your blogs whenever I can. Lynettea came home this afternoon to tell me some sad news. The dog called Monty from next door went to the Rainbow Bridge for dogs last Saturday. He was the dog that frightened me last week. Jai and Wallis, his owners, were very upset. That is probably why Wallis was hiding in my ferns. He can't have been upset for long though, as he was pinching my catnip this morning. The picture is of Wallis looking at me. me when I go out and tries to pounce on me. Lynettea is always trying to keep him from attacking me. She says we must be tolerant of Jai, as other cats attack him. Personally I am not surprised. Wallis is sensible and stays inside at night. Jai runs around all over the place. The bottom picture is of Wallis and Jai staring at me through the window. I am not sure if we will be able to go as it is very early on the morning of 13th January for us. It is already late on 12th January here. Anyway we will be sure to visit later on to see all the fun things. Love from Diamond to Kimo and Sabi and all their human family. I hope the baby grows up well trained. At least she will have proper cat trainers at an early age, which is sure to help. 1. This is going to take a long time, as I am so normal. Maybe that is the weird thing number one. 2. I run my own blog. Humans think this is weird. 3. I am extremely nice and soft and fluffy (is this weird?). 4. I like to sit on the hot water service on a hot day. Humans think this is strange, so I put it down. 5. I enjoy a sponge down with water on a hot day. Lynettea says this makes me look like a half drowned rat. Not a nice thing to say. I would claw her, but as I am a nice cat, I can't. 6. Well we are getting there. When I want to hide I go up the top of the dresser where no-one can see me for hours. Lynettea has seen me now, so this is not working as well. She used to wonder where I had gone and run around outside looking for me in a panic. 7. I don't like large dogs sniffing at me. A large dog sniffed at me last week and now I won't go out the front at night. Lynettea says it wouldn't have hurt me, as this dog has two cats of its own. How can a dog have cats I ask you? I know these two cats have a dog. The cats are always coming in to my place. Today one was hiding under the ferns. I sat and watched it for a while, then we had to go inside, because Lynettea wanted to do something. She always wants to do something else, just when I have started to enjoy myself. I made her brush me after that, as I thought it would settle her down. Labels: normal, Russian blue cat, weird.